Update, 10/29/2016: We've changed our ratings of these two bulbs based on the proliferation of new smart LED bulbs on the market. You'll find our current opinion of the Cree Connected white LED smart bulb here. Buyers will also want to be aware that GE has ceased production of the Link bulb, replacing it with the C by GE series. You'll find our current thoughts on that product here. If you’re considering switching from incandescent to LED light bulbs to save energy, you should consider switching to a so-called “connected” light bulb that you can control and schedule using an app on your smartphone. These bulbs are considerably more expensive than the incandescent variety that are being phased out, but these new models from Cree and GE don’t cost much more than regular LED bulbs that must be controlled with a wall switch. To enjoy the connectivity feature, you’ll also need to invest in a ZigBee hub. Cree recommends using either the Wink hub or the Wink Relay (a touchscreen model that mounts on the wall), while GE recommends using its own Link hub (a small plug-in module) or either of the Wink hubs. But in both cases, any hub that supports the ZigBee connectivity protocol should work fine. Aesthetically speaking, GE’s Link bulb looks much prettier than the Cree—at least before its lit. I tested both bulbs with the $50 Wink hub and the free Wink Android smartphone app (there’s a version for the iPhone as well). 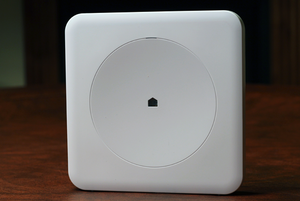 I’ll publish a separate review of the Wink hub (and eventually the Wink Relay) at a later date. I compared the Cree Connected LED light bulb to GE’s Link, using a GE Reveal halogen incandescent bulb as my baseline. All three bulbs have a medium-size screw base (type E26), and I used a common table lamp to test each of the three bulbs. Both the Cree and the GE Link LED light bulbs can be controlled via Wink hub (shown here) or some other type of ZigBee controller. GE markets the Reveal bulb as an energy-efficient model in that it produces enough light—790 lumens—to be equivalent to a conventional 60-watt bulb. GE rates the Reveal’s color temperature to be 2950K, which means it’s a very “warm” light. The Cree Connected bulb is rated to produce 815 lumens of brightness while the GE Link is rated at 800 lumens. Both manufacturers claim a slightly cooler color temperature of 2700K for their bulbs. I purchased a four-pack of the Reveal bulbs at Home Depot several months ago for $3.67—that’s about 92 cents per bulb. The Cree and GE LED bulbs, by contrast, cost $14.97 each. But using these bulbs should cost less money to operate over the long haul, because LED bulbs are not only much more efficient, they also last a lot longer than incandescent bulbs. Beyond the acquisition and operation costs, changing a light bulb to gain smart lighting is a whole lot cheaper and easier than replacing a wall switch or a receptacle with a connected model. Replacing a switch can cost anywhere from $40 to $80 or more, assuming you do the work (as opposed to hiring an electrician). I screwed the Reveal bulb into my lamp, plugged the lamp into a watt meter and confirmed GE’s claim that the bulb consumed 53 watts of electrical power. When I tested the Cree, the watt meter indicated that it drew just 10 watts of power (1.5 watts less than Cree takes credit for). GE says its Link bulb draws 12 watts of power, but my watt meter indicated that bulb’s drew the same amount of power as Cree’s: 10 watts. The watt meter reported that the Wink hub drew just 1 watt of power. According to GE, the Reveal halogen bulb will cost $5.18 per year to operate (based on 3 hours of use per day), while its Link bulb will cost just $1.45 per year to operate. Cree says operating its slightly brighter bulb will cost $1.64 per year. The Cree bulb is on the left and the GE Link is on the right. The bulb in the middle is a GE Reveal halogen incandescent. But the real savings doesn’t come from the $3.73 (or the $3.54) difference in annual energy costs, it stems from the fact you’d need to replace the Reveal bulb two dozen times over the lifetime of a single LED bulb. Where the Reveal is rated to last 0.9 years, Cree and GE say you can expect one of their LED bulbs to last 22.8 years. Lighting a room 3 hours per day for 22.8 years with a Reveal bulb will cost $141.40, but it will cost only $52.36 with the Cree and just $48.03 with the GE Link. That’s a lifetime savings of $89.04 or $93.37 respectively (although that doesn’t include the cost of the hub, which can be used for many things other than lighting control). In either case, the Cree and the GE Link bulbs will pay for themselves several times over—that’s assuming, of course, the lamp they’re in doesn’t get knocked over in a pillow fight, smashing the bulb to smithereens in the process. 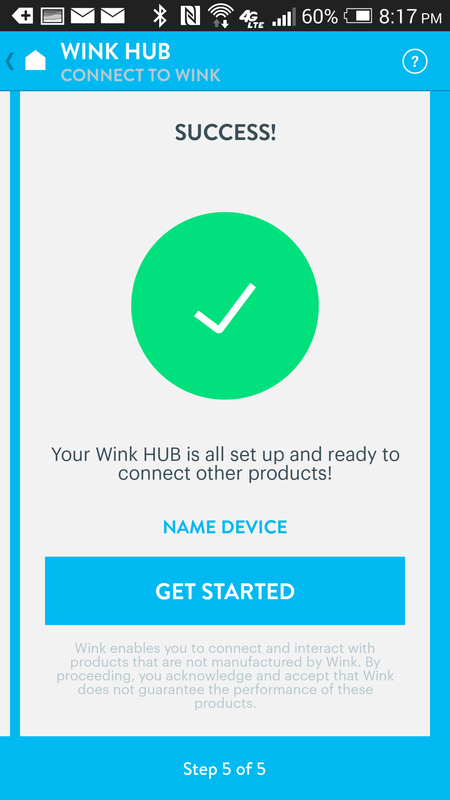 The Wink hub was a breeze to install, and so was the process of connecting the bulbs to the Wink app my smartphone. 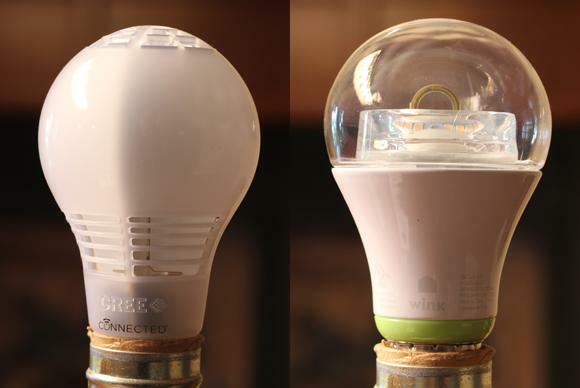 Aesthetically speaking, GE’s Link bulb looks much prettier than the Cree—at least before it's lit. And its clear glass dome contributes to its heft (6.2 ounces compared to just 2.0 ounces for the Cree bulb), giving you the feeling that you’re getting more for your money. The Cree looks and feels cheap, with its dome being constructed from translucent plastic, with horizontal vents perforating its base and top and a seam appearing when its lit. Don’t be fooled by appearances. LED light is highly directional, and while the LEDs in the GE Link are arranged in two half circles, much of the light they produce shoots straight up. An arrangement of baffles inside the Cree bulb distribute the light much more evenly, giving the bulb an omnidirectional property the GE lacks. And while both bulbs are described as “soft white,” the light pass through the Cree’s translucent plastic looked softer than what radiated from the GE. My wife also preferred the light the Cree bulb cast. Those are necessarily subjective opinions, of course. You might well prefer the look of GE’s bulb, and it does have a slightly lower cost of operation. Before you plunk down your pennies for either bulb, you’ll want to know about one significant limitation that impacts both: Neither of them can be dimmed using a conventional dimmer switch. You can dim them with the Wink app (as well as arrange bulbs into groups and schedule them to turn on and off automatically), but those things will necessitate your pulling your phone out of your pocket and launching the app. If you want the ability to do all that from either the wall or your phone, you’ll need a connected dimmer switch and a conventional dimmable LED bulb. GE's connected LED bulb can't change colors like some other LEDs, but it's relatively inexpensive and delivers all kinds of smart features when used in conjunction with a ZigBee hub. 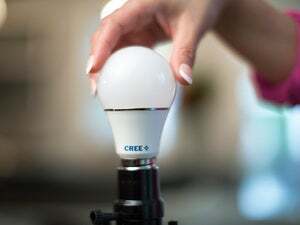 Cree's Connected Soft White LED light bulb isn't the prettiest lighting fixture, and it can't change colors like some other LED bulbs, but it's smart and it's inexpensive to acquire and operate.